No. 233-235, Jalan Pudu, 55100 Kuala Lumpur, Malaysia. Founded in 1979, formerly know as "Chop Woo Sun" established in 1949. 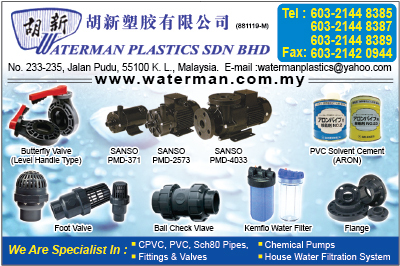 We are specialized in distributing PVC, CPVC, ABS, HDPE Pipes & Fittings, Valves, Solvent Cement, Household & Chemical Pumps, Testing Pumps, Water Purification System, etc.